Pale straw color with a hint of amber. Very light nose: a touch of citrus with notes of lychee and banana peel. The mouthfeel is a very balanced sense of gentle fruit, and acidity. The finish provides a nice tannic pull in the mouth with an aftertaste of pear, green apple and lime. The first thing you notice is the subtley of the wine; it is very balanced, seemingly discrete. The delicacy of this white was an immediate huge hit with two others who tasted with me, without any prompting, voiced their appreciation from the first sip. One liked the easygoing quality and how well it matched our meal (cucumber/tomato salad with balsamic vinegar, baked salmon with lemon, sides of mashed potatoes and steamed broccoli). Yet another commented on the wonderful, gentle flavor, then on the unusual design of the bottle- with squared edges, looks more like a European olive oil bottle (perhaps a nice recycling option). 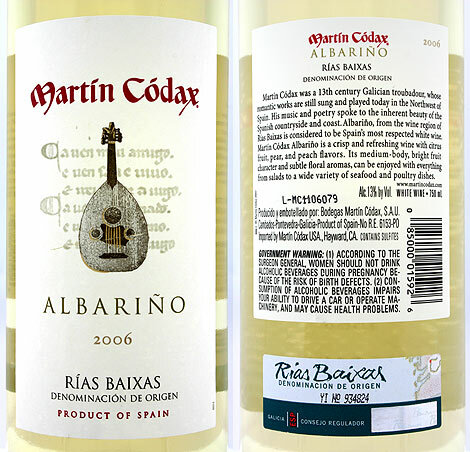 This is a perfect wine for sipping in the afternoon sunshine or pairing with light seafood. I tasted this wine over several days and really enjoyed it; it remained perfectly consistent over three evenings, paired beautifully with food and was very enjoyable at twilight in the backyard. While subtle and demure in character, please note that the crisp acidity will allow it to accompany white meats and stronger fare without being lost, which allows for great flexibility. 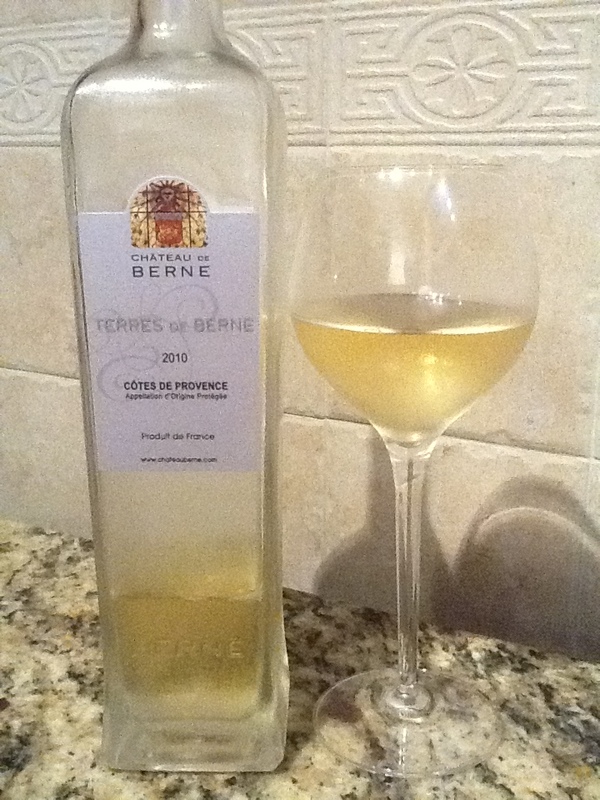 Chateau de Berne’s Terres de Berne AOC Blanc is comprised 50% Ugni Blanc and 50% Semillon grapes. Provence is the southeastern region of France that site between the Mediterranean sea and the Rhone River. Chateau De Berne sits just north of the quaint town of Lorgues, about 70 km west of Cannes. A delightful area to visit, its wines are one of the regions that have managed to not explode in hype or price as of yet. This wine is a great example of a well-made vintage that offers tremendous value: this kind of delicacy could be found possibly in a burgundy or bordeaux blend, but those would price at more than double or triple the price of this wine. It is quite simply, a very nice wine and a huge value. You can check out the winemaker’s website (unlike many other winemakers, they actually did a good job on theirs!) and you can also buy the wine directly from Wine Chateau at a price that I consider a good bargain. If I had the room in my cellar, I’d buy a case. Hmm, maybe a good tasting party could solve both those issues… but I digress. Deep purple color with a nose of violet, barnyard, and black fruit. 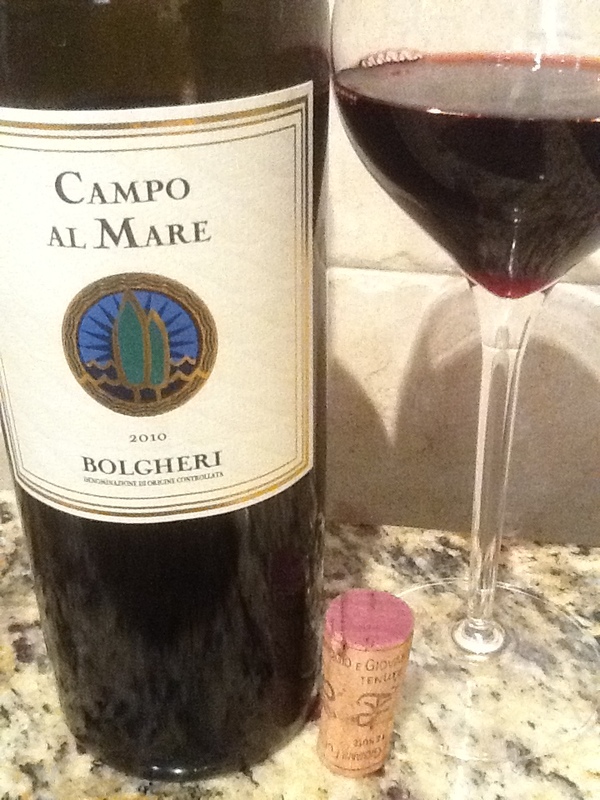 In the mouth, spicy pepper, black plum and blackberry dominate with some green vegetation upfront. Notes of spice box, mushroom, potting soil, stone and oak. Tight tannins with a lingering finish push some flavors to expand upwards through the back palate. Tasted over four days with steak, pasta, strong cheeses. 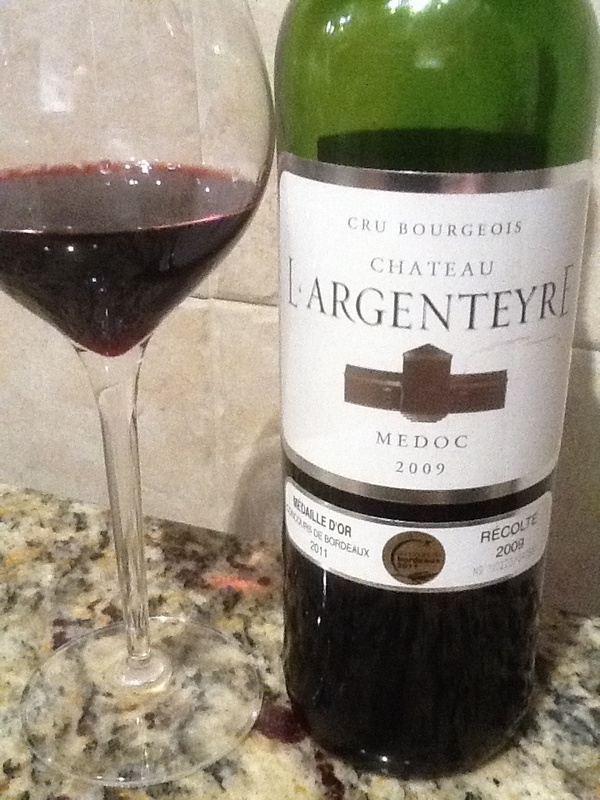 Pairs easily and nicely, is better with food, and I preferred this wine slightly chilled to reduce the funk and allow the tannins a little more bite; you might prefer otherwise. I sat down on a quiet Tuesday night with winemaker Jason Fisher to talk about wine and taste his work. Jason was running on fumes, yet still jovial after a day dashing around the concrete jungle instead of plying his trade amongst his beloved vines, tools, and truck. An observer might think we were two old buddies meeting to discuss business and family- and would be halfway right- but we’d never met previously. Next time, we surely will be old friends with more great stories to tell. 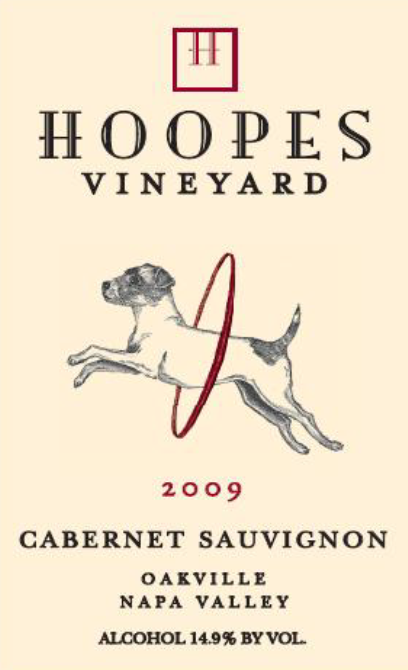 Jason is the artisan winemaker, and one-third of the Hoopes, Hoopla, and Liparita wine team, along with Spencer Hoopes (proprietor and namesake), and John Healy who handles sales. This trio manages to churn out seven thousand cases of wine between the two labels annually, and unless we East Coast wine junkies start working for it, most of those cases may stay in California, where the bulk currently goes. You might think that spending an evening drinking wine with a biochemist is a dull, systematically boring idea- unless like me, your grandfather was a chemist and your sister was a forensic biochemist. Jason’s biochemist/oenologist background was amazing to me, and offered an opportunity to discuss the exact process and choices he considers on a daily basis when making his product. I think every wine lover/drinker would relish an opportunity to spend time with the person who makes the choices in crafting a boutique, ultra-premium wine. I certainly did! But far beyond Jason’s intellect, oenological prowess, and advanced degrees is a passionate winemaker and lover of quality. And even if you don’t care for details and chemistry, you will still be wowed by his charisma and impressed by his obvious love of his work- creating delicious wines. 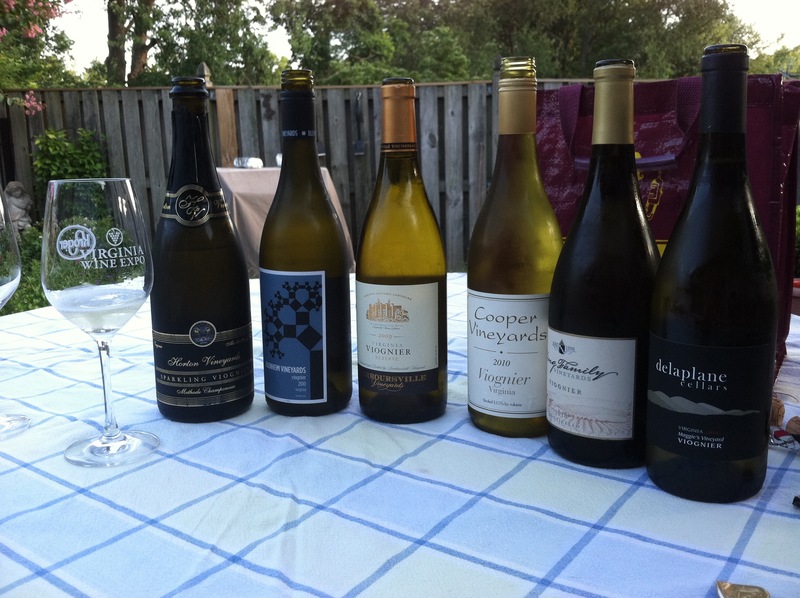 Speaking of which I will now bring up the topic you’ve all been waiting for: WHAT WE TASTED! It took me a day to characterize what I love about this: it’s the un-chardonnay, since it never touches the oak that so many other winemakers use to mask problems. 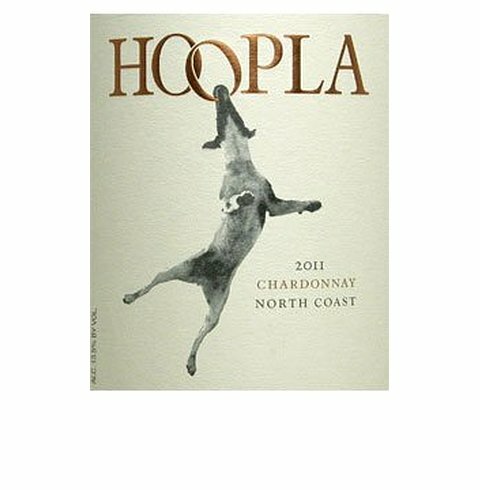 Hoopla exemplifies everything that is good naturally in chardonnay: It tastes as though you plucked the grapes right off the sun-washed vine. Citrus, grapefruit and honeysuckle dominate while notes of flint, gravel, and granite speak of the Yountville terroir. You realize as the wine expands and changes in the mouth, that it ferments and ages in stainless, never seeing wood- keeping the true characteristics of the grape intact, showcasing the terroir, grape, fruit selection, its time on the lees, and time spent in steel before bottling. It’s all out in the open, and it shows wonderfully. At under $20/bottle, it is no wonder the Californians won’t let this out of their sight! 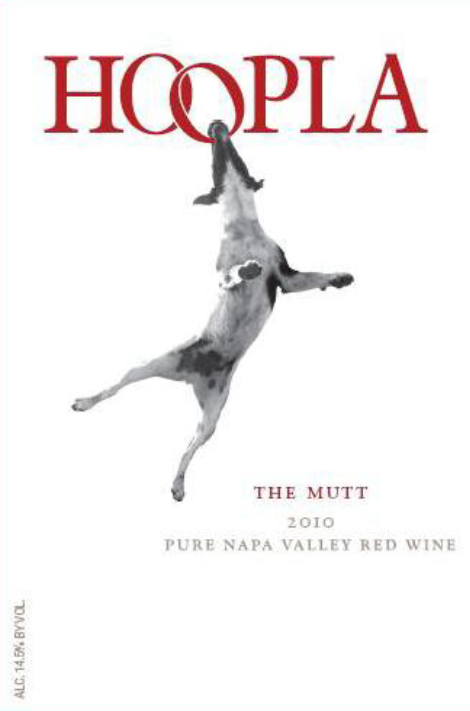 Mutt is a blend that includes 80% cabernet, 10% old vine petite syrah, and 10% merlot. It has a deliciously musty nose, and on the mouth hits you with big spicy mulberry, boysenberry, and pepper with cedar on the lengthy finish. Not too big for its britches, this is a wine you can enjoy with your friends in the backyard, at a black tie dinner, or as a lovely gift idea. Flexible, capable, and athletic come to mind when thinking about this wine. And the label is great, I hope to meet this dog (Dante) one day, and his owner, Spencer Hoopes. A ‘classic’ cabernet with a nose similar to the Mutt (delicious mustiness, reminder of wonderful old world reds). Old World melds with Classic Napa. Big, black fruit bursts in your mouth initially with clove, graphite, earth, loam and tight tannins following. This wants to be opened and see air, so decant or open hours before drinking. A delightful wine, fits well in the competition of Napa “establishment” reds like at a lower price range and to me, this is a killer value as it drinks like a $150/bottle. Very good now, I expect it will mature beautifully. 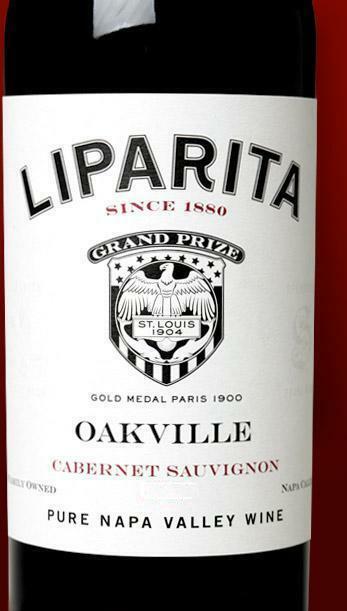 This cab tastes of all red fruit: red plum, bing cherry, raspberry are forward with wildflowers on the nose and notes of spice, oak, shale, gravel, and vanilla on the back palate, good tannins throughout the long finish. A delicious Napa that immediately compares to Plumpjack, Conundrum, Stags Leap, and Highland Estates. Lush and sophisticated, it was only a small surprise to me when Jason proudly stated these grapes are the Old Wente Bordeaux 337 clone, aged 33 months in all French oak. This may be the Screaming Eagle for the rest of us, as it accomplishes the massive quality with first red, then black, then blue fruits in succession, the intense structure throughout the midpalate with a huge finish, yet the soft and feminine aspects are very present, most notably with the very gentle tannins. I so very much wanted to bring a bottle of this back home and deconstruct it in small sips, as I was perplexed by the number of sensations I experienced on the tongue, midpalate, backpalate, and finish. Again, this is a wine that is an excellent value and would be appreciated dearly by the new world wine lovers. My only problem with Jason Fisher’s wines? I wanted more. Really, drinking these made me want a mixed case to drink over a couple of weeks so I could try several pairings and carefully note changes over time with air. But like many great things in life, a long night passed too quickly and left me with a nostalgic feeling and desire to find these wines again, and share them with friends. This, my friends, is a good thing. The best news? Beyond letting you know that another little-known group of high-value wines deserves your attention and patronage, I get the honor of sharing with you the information on where you might access these bottles locally. In the metro NY area, you can find Hoopes, Hoopla, and Liparita wines in end-sale establishments like Astor Wines, Colonial, Main Street Cellars, Premier Wine & Spirits, Ridge Fine Wines, Vinomania, and Wine Library, as well as fine dining establishments like the 21 Club and London Lenny’s. At the beginning of this too-long post, I mentioned that my introduction to several great modern-day American winemakers have all been either coincidences or pure accident. One day when I’m telling people about sitting down and meeting Jason Fisher for a night of one-on-one wine discussion, I expect people will respond as if I told them I was hanging out with Baron Eric de Rothschild downtown on a quiet Tuesday night. For now and then, it’s just karma on a not-so-quiet-Tuesday-night. Evidently, it’s really good karma. Because Jason expressed that knows that quality matters more than price, more than image. If it’s worth doing, it’s worth doing right. If it’s all about making good wine to start with, you’re going to end up with some really good options. And these options happen to be really wonderful in your glass. Ah, summer. The mere word brings joy to our minds. Recall the childhood years when you couldn’t wait until you could escape school. These days, you might relive those moments over again for (or with) your children. And we can’t forget the activities of summer, such as beachgoing, ballgames, hiking and camping, the list goes on and on. What about the wines of summer? Some people try to drink the same wines they enjoyed the rest of the year. I suggest you broaden your horizons and try some of the refreshing wines that can open your eyes and palate all summer long. While pinot grigio, chenin blanc and chardonnay are popular and easy to find, I can’t begin to tell you the joy you’ll have in finding something delicious and new to add to your repetoire! These are especially ideal for late afternoons and those early evenings on long, sultry, summer nights. 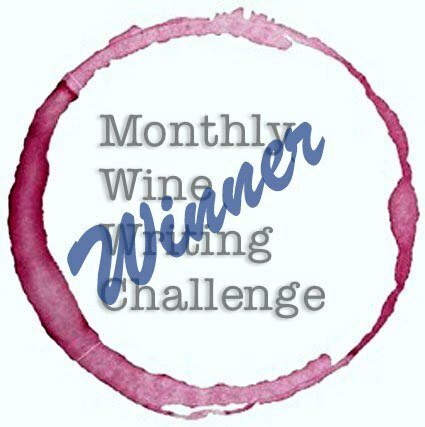 While the pictures may be of specific brands and I have blogged about many of these, today I’ll simply suggest the grape and wine type you look for in your local wine store, and see what you can find! When I’m shopping locally, I like to pick up a bottle (or three) of something new to try at a neighborhood store to drink in the next few days, and order by the case the wines I want to cellar for the future. 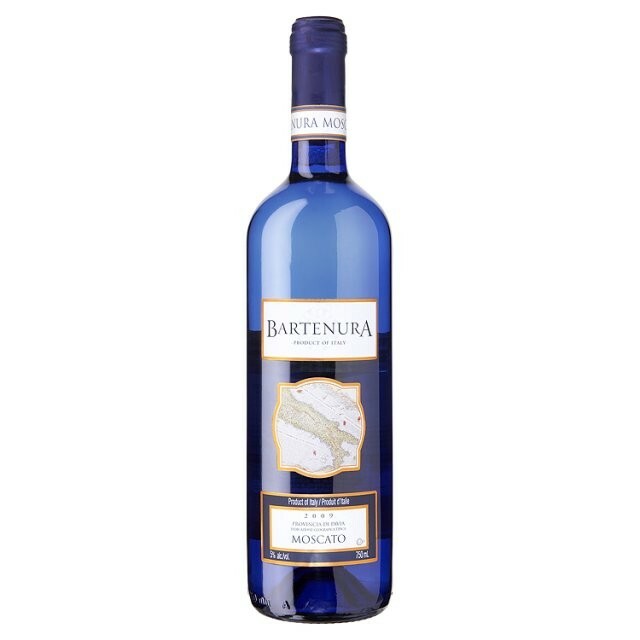 Moscato– honeysuckle and orange blossom help make this gently sweet wine a delicious aperitif. 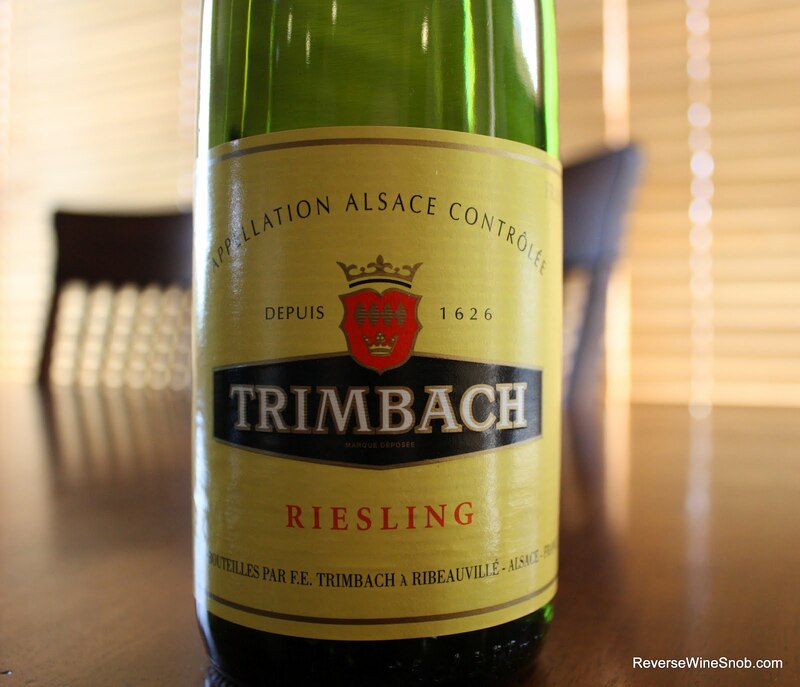 Riesling– a year-round staple in my home. Simple two to three note wines with gentle fruit, excellent minerality and crisp acidity. 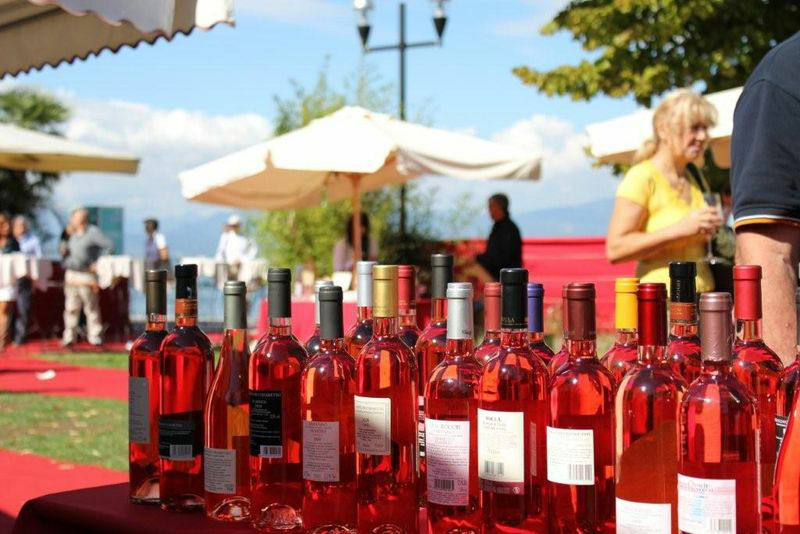 Rosé– this pink wine made from the red grapes (but without the skins, this can be an incredible ‘bridge’ wine that will work with salads, seafood, soup and steaks. Vino Verde– a touch of fizz with citrus, green apple, and pear. Viognier– peach, apricot, honeysuckle, and nectarine flavors are common in this grape. Please let me know what you try this summer, and how you liked it! The Summer Breeze in Wine: Vinho Verde! One of my favorite wines that is still WAY under the radar is Vinho Verde. One of Portugal’s lesser-known exports, this is a fresh, crisp wine (often with a little carbonation) that is delicious, perfect to cleanse the palate or enjoy at a cocktail party, and is super inexpensive. Best yet, unlike my other under-the-radar favorites, this one is easy to find in most stores. Today’s vinho verde is Alianca , a delicate ‘vinho branco’ (or white wine) blend from Northeastern Portugal that is 10% alcohol by volume. With a classic greenish-yellow tinge in color, the citrus nose sits between lime and grapefruit. This one is gently fizzy, with good, crisp acidity on the mouth and a dry, balanced palate of lemongrass, citrus, granny smith apple and young anjou pear. I pulled this out of my fridge at the last minute for a neighbor’s backyard get-together. My hope of using this to introduce several friends to vinho verde went over well, and it was quite popular, and perfect like a summer breeze. Here’s the real kicker- I found it locally (Mayfair Wines & Liquor for those in my area of NYC) and it was $7/bottle. Seven bucks. Against my favorite $30+ Sauvignon Blanc, this is the one that everyone wanted more of at the cocktail party. I suggest you find a local wine store, ask for a vinho verde, and try it with unsuspecting friends! See what they think- you might surprise them, with something new they’ll thank you for! Older wines can be a special treat. They can also be a big disappointment, but that’s for another post! I recently had the fortune of being invited to visit friends at their beach house on a holiday weekend. Before leaving my home , I sensed an opportunity in the air and grabbed two bottles from my wine cellar that were getting past their prime drinking years. These are friends who both enjoy wine and make wine, and if this wine was still good I knew they’d appreciate it, and if it had turned I knew we’d all have a laugh instead of tears. When the moment came, I opened the bottle. The cork smelled good, and I sighed with relief. I ventured outside, sat in a beach chair with my feet firmly entrenched in the sand, poured a taste, scrutinized the nose and color, and ventured forth. This wine still has reminiscent fruit hidden behind dusty rose on the nose, and the palate expanded upon that start. Black cassis and a hint of boysenberry wrapped in the same mellow floral bouquet, followed by a medium-long expanse of earth, tobacco, and old wood. We poured small tasting amounts at a time to revel in the nose and remind ourselves to savor the aged fruit, the dark flavors, and appreciate the long, gentle tannins and the depth of this mature pleasure. As the wine aired, it settled to a nice refined state in which even the neophytes who tasted could sense the age, depth and character from a fully mature wine in opposition to a recent vintage. You can find the link to Chateau Le Gay here, but be warned- révisez votre français avant d’entrer, ou vous risquez d’être déçu par vos résultats. For those who don’t speak the language, the site is entirely en français- oh, je m’excuse- I mean, in French. I found this vintage at a wine storage facility for $35/bottle. This chateau has consistently rated in the low 90’s and high 80’s over the last 20 years and at that price, is an interesting point for discussion without being either overpriced or ostentatious. For the sake of comparison, I opened a more recent vintage that perhaps barely qualifies as old in the wine world: a 2001 Chateau Simard that I picked up on sale from Sherry-Lehman at $27, noting it now lists in the mid-$30’s. 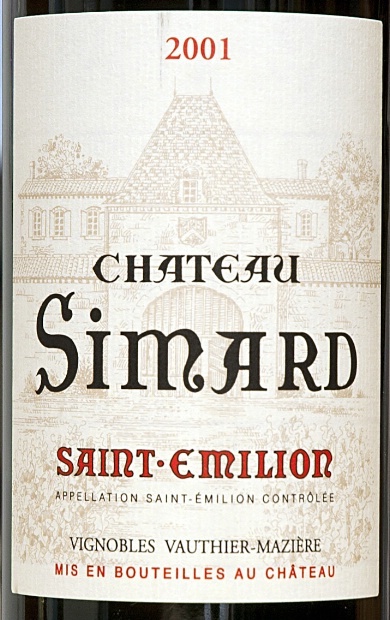 The ’01 Simard showed a ruby color with a nose of black fruit, on the palate presenting cassis and black plum with licorice, mushroom, chocolate, and a hint of gravel. 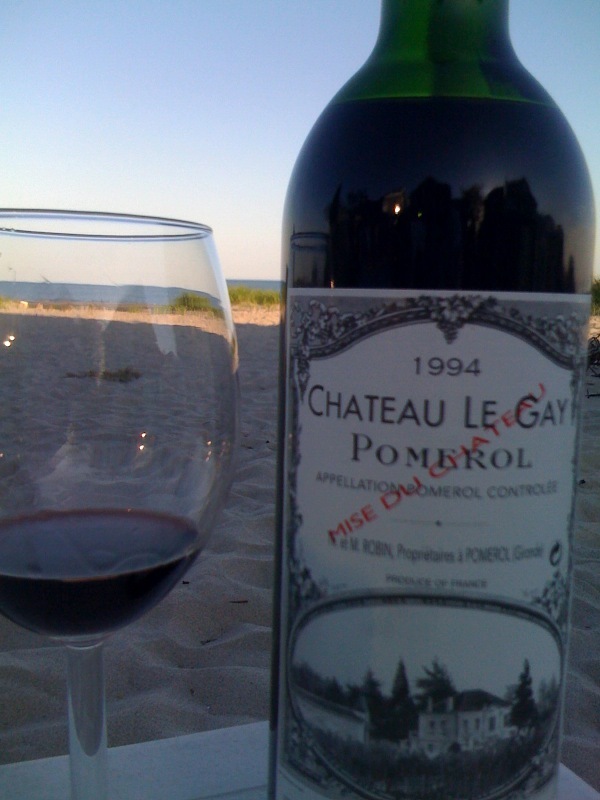 This bottle plays the fruit against a nice acidic balance and stronger tannins, demonstrating perfectly the examples of aging when compared to the ’94 Le Gay or a modern blend. You can find the link to Chateau Simard here. The experience of an older wine can be just as special as a very expensive wine. For me, opening an old bottle with good friends who enjoy wine makes it far more enjoyable an experience. And if you had a group of friends who want to learn about wine, these two wines show just one example of how you could plan an evening with one or two young wines against two older wines to demonstrate the changes as wines mature- just be sure to do some research and use wines that have the ability to age well and note the suggested drinking years. It’s also important to learn how to decant and pour wines so you don’t have friends drinking sediment from their glasses. A little research goes a long way, and I can tell you from experience, it’s no fun at all when you open a bottle thats corked. But an old wine with good friends can make a wonderful night just that much better!